Last week Christine, the kids and I had the über privilege of an amazing vacation. 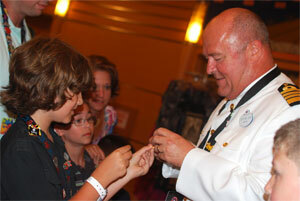 We sailed for 8 days on the Disney Magic right out of the port of New York to the Bahamas. This was an amazing experience on so many levels but in the middle of the trip I became super humbled by what we could learn from Disney as church leaders. Hunter & Captain Trading Pins! Later that night it hit me that what Disney is doing with it’s Cruise Line has huge lesson for church leaders seeking to make an impact in their communities. At 7:30pm that evening Captain John (and the rest of the executive leadership team of ship) met guests for a pin trading event. Really. They spent a leisurely hour chatting with kids (big and small) about Disney Pins and allowing guest to trade them for any pin that they had. 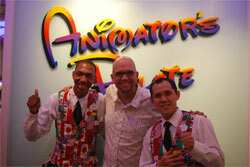 In the middle of this simple event it hit me the real “magic” that Disney was crafting around me. Somehow this company that does over $40 billion in sales and has 154,000 staff members was creating intensely personal experiences for us. Here were the same leaders that earlier in the afternoon were making potentially life and death decisions taking time to connect with my kids. I was floored . . . and then got thinking about the church I lead. How am I helping to create an environment where my teams are connecting personally with our people? Why is it hard for churches of a few thousand people to create these connections when a massive company like Disney is doing it all the time? If a profit driven company is so passionate about personal connections shouldn’t our churches at least match that passion when we have a much more important “bottom line”? Follow Up // At the pin trading event Haley got asking the head of navigation about two of the “maritime flags” on a pin that she has. The next day in our room was a card from that senior officer with a photocopy of all the maritime flags for her reference! Repeat: The officer in charged of making sure the ship finds it way home wrote a note to us so my 11 year old daughter could understand a $4 pin better. Ouch . . . I need to do more of that. Technology // Throughout the experience they are using technology to personalize the experience . . . from facial recognition in their on board photography system so any pictures taken were associated with our room key to the way everything was ready for us in our room when we arrived like we registered online for months in advanced. We need to leverage technology to build bridges and not see it as cold and impersonal. It’s About People // On the last morning of the cruise we all cried when we had to say goodbye to our dining room servers Willy and Solomon. These two had been with us through each evening meal during the week. They shared jokes, magic trips and pirate sword fights! But also talked about life at home in the Philippines and South Africa respectively. They set a new bar for me in what the word “service” means. Amazing. Creating Space for Parents to Win // The highlight of the trip was a day at Castaway Cay . . . Disney’s Private Island in the Caribbean. The space was probably one of the most beautiful places I’ve even been too but it was beauty wasn’t the vista but the “easy win” it made for me as a dad. They have crafted an amazing snorkeling lagoon in the ocean – complete with sunken ships, thousands of fish, beautiful corral and space to freely explore as a family. At one point I was snorkeling through this amazing place hand and hand with both of my kids . . . literally crafting memories that we will take with us for the rest of our lives. Although Disney set the table for that experience they weren’t worried about pushing their agenda (or brand) at that moment . . . the win was for us to be together as a family. I got thinking about our family ministries . . . do we help parent’s win enough with their kids? Or are we more concerned that kids are connected with “our ministry”? So glad you had a fantastic time at Disney. Our experience on the cruise several years ago was fun. The best part was how much they thought of the child in building out the experience on the ship. Don’t get me wrong, it wasn’t just a kids’ activities boat. It was a typical cruise, several night clubs/restaurants for adults, etc. But the point is that their kids stuff wasn’t an add-on. It was on equal-par/priority as the adult stuff. I wonder how our churches think about kids and student ministries. Do we make them a priority so that they get the same amount of resources invested in them as the “adult stuff”? We seek out the best preacher teachers for adults. Do we do that for the children? The other takeaway I can share is from my visit to Disney Orlando a couple of months ago. They make it easy for you to learn about different / other parts of Disney once you are involved in one area. For example, we were at the ESPN Wide World of Sports Center, but when talking with the guest services people there, I learned more about the other parts of Disney we wanted to explore on our trip, than whatever we were going to do within the ESPN WWS complex where we were at that day. They made it super easy for us to ask questions and connect with other parts of Disney. In churches, our “departments” tend to be compartmentalized. So the cross-pollination doesn’t happen as much as it could be if we had some Disney-esque approaches in place in my estimation. Disney is always a great place to learn! Already looking forward to going back again. I worked for Disney for 6 months so I got to be around all of these amazing (some, sadly, not so amazing) people employed there. What you’re saying is awesome, we definitely SHOULD take notice of what Disney is doing and try to apply some of it to our own lives and churches, but you should know that most (if not ALL) of these people do what they do for a paycheck, not out of the goodness of their hearts. There are a lot of them who absolutely love their job and love all the warm fuzzys they feel by bringing joy to people’s lives, but it still comes back to the paycheck. Disney employees are extensively TRAINED (the cruise line employees are the best of the best) to do what they do, to go that extra mile, but if Disney asked them to do they job without the paycheck, there would be no Disney. Yes, Disney is a wonderful place, and we can learn a lot from them, but it also needs to be understood that the motivation for what they do isn’t God, it’s a paycheck. I guess what I’m trying to say is that, we as Christians, are called by God to do these same wonderful selfless things for FREE, and why aren’t we? Money is the real motivation behind Disney, so what’s our motivation and why isn’t it working? Are you in a portable church? I need your help!